But let us look at the story and find out the real spiritual meaning as brought to us by the final prophet, Victor T. Houteff. We shall see a pleading story from God to us His remnant church, a story that shows the depth of His love for us and the desperation that exists in bringing her back to Him. Let us now break this story down and study it from our prophet’s interpretation. We immediately see that this wife and these children symbolize God’s people departing from Him, and that such a wicked act, He calls whoredom. To break the bow would mean to break the nation’s military strength. The history of this is recorded in 2 Kings 10, 11. The name of the third child was to signify that though Israel and Judah were God’s chosen people, the day was fast approaching in which they would no longer be called His people. The fulfillment of this phase of the prophecy brings us to the Christian era. Let us here for a moment discuss the titles “Judah” and “Israel.” When superficially read these titles are as a rule misconstrued and made to mean the identified Jews. But we must not be superficial readers and thinkers. Let us be deep Bible students. Now, everyone knows that the identified Jews of today are but a handful — certainly not as the sands of the sea. The innumerable children of Israel, therefore, cannot be the unbelieving Jews of today. 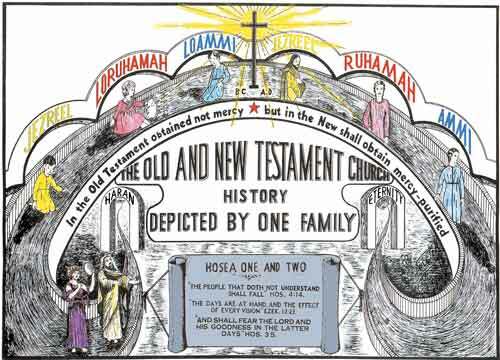 Besides, theidentified Jews of today are not the descendants of the ten-tribe kingdom, but of the two-tribe kingdom. Who, then, is this multitude of people referred to in Hosea’s prophecy? We must not overlook the fact that the Gospel of Christ divided the house of Judah into two sects — Jewish and Christian, that the Christian church for about four years after the resurrection of Christ consisted practically only of Jews. Plainly, then, the original Christians were full-blooded Jews, — the Christian church is only a branch of the Jewish church, but they and their descendants have, through the years, lost their racial identity. Then, too, the descendants of both Israel and Judah who through the years of captivity lost their identity as did the Jews who embraced Christianity, according to prophecy must also have greatly multiplied. Plainly, then, many who are taken as Gentiles, are but unidentified descendants of ancient Judah, Israel, and the Jewish Christians. The Christian church herself is, as we have seen, a Jewish-Christian church. Of those who first embraced the Christian faith, the Apostle Peter speaks thus: “Which in time past were not a people, but are now the people of God: which had not obtained mercy, but now have obtained mercy.” 1 Pet. 2:10. And the Apostle John says: “But as many as received Him, to them gave He power to become the sons of God, even to them that believe on His name.” John 1:12. The Word of God, therefore, definitely declares that the subjects of the torn-down kingdoms — Judah and Israel — as Christians, along with the Gentiles that have joined them, will gather together and appoint themselves a king. This entry was posted on June 25, 2016 at 5:05 am and is filed under Elijah Interpretations, Prophecy study. You can follow any responses to this entry through the RSS 2.0 feed. You can leave a response, or trackback from your own site.